It is clear that people living in south Asia have significant number of similarities, which makes it difficult for people to give the differences between people from different nationalities. Koreans, Chinese, and Japanese have similar physical and behavioral characteristics unlike people from other countries. The similarity between the Chinese and Japanese is so profound that one may refer to a Japanese as a Chinese citizen and vice versa. However, despite the large number of similarities, there exist a significant number of differences between Chinese and Japanese faces. Japanese face has its own significant properties that are different from the faces of the Chinese or other people living in Asia. Some of the properties of the Japanese face include longer and wider faces, pale face, especially for the people living in the cold regions of northern japan, and bigger eyes, which are angled downwards. It is easy to detect a Chinese just by the look of his or her eyes, especially for those people who have constantly interacted with the Chinese people. One of their distinct facial identity is that they have a rounder face with smaller eyes, which are angled downwards. One of the primary difference between the Japanese and the Chinese faces is their complexion. Although majority of them seem to have a similar white or red complexion, the Japanese living in the northern japan have a pale complexion on their faces. In addition, the minority tribes of Aomoni and Hokkoido have a pale skin on their faces, which is highly attributed to the climatic conditions of the northern Japan, which is cold throughout the year. On the other hand, Chinese have mixed complexion due to the differences in the tribes from the Han dynasty and the intermarriages among these tribes. However, majority of the Chinese population have a white complexion. The shape of the face is another distinguishing aspect that individuals studying the differences between the two nationalities should understand. Japanese have a longer and wider face, which makes them to appear as if they have a big head. Interestingly, their faces do not seem to have any regular shape but is generally described as longer and wider which makes them to have a wider front view. This is not the same to the Chinese people. Chinese have a rounder face, which makes it easy to detect them, especially when they are in other countries. Majority of the Chinese have a definite shape on their faces, which almost resembles a perfect circle. 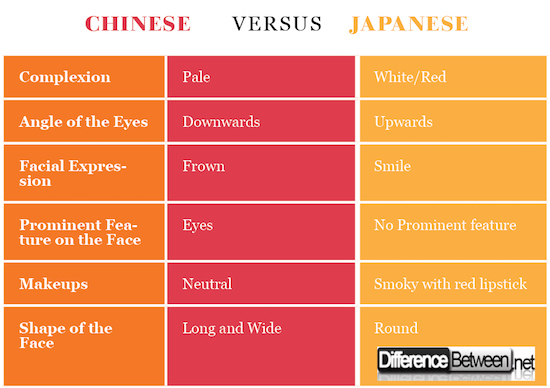 Although both the Japanese and Chinese have smaller eyes which seems to be the same for all the Asian tribes, there exist some contrast between the Chinese and Japanese eyes that can easily be detected by any person who pays a closer attention. If one has a closer look, it is clear that Japanese usually have “chinky eyes” with an almond protruding hooded parallel eye shape. In addition, their eyes seem to be slightly bigger and are angled downwards. On the other hand, the Chinese people have their eyes with the focus area above the eyelids and under the eyes. Moreover, their eyes are of medium to smaller sizes and are usually angled downwards. Facial expression refers to the emotional aspect that is expressed through the face after one faces something that either exiting, annoying, or surprising among other aspects. When Japanese people are exposed to such conditions, they tend to show a frown face which is caused by their bigger eyes. On the other hand, Chinese people have a distinct facial expression, which shows as if they are smiling when they are subjected to an emotional aspect that is either surprising, exiting, or annoying among others. This means that is difficult to explain whether a Chinese person is annoyed, either happy, or even surprised. The most prominent feature in the face of the Japanese people is their eyes. This is because they are big and can easily be seen by any individual. In addition, they have a longer and wider face, which gives a bigger view of the eyes making them to one of the prominent features on their faces. On the other hand, the Chinese have round and smaller face, which makes their eyes to look less prominent. Both Japanese and Chinese women use makeups on their faces, which can be used as a factor to distinguish between the two similar nationalities. Japanese women use neutral makeup styles, which mean that it is difficult to understand whether one has applied makeups in her face. The Chinese use smoky look and red lipstick and can easily be identifiable among different tribes from Asia. 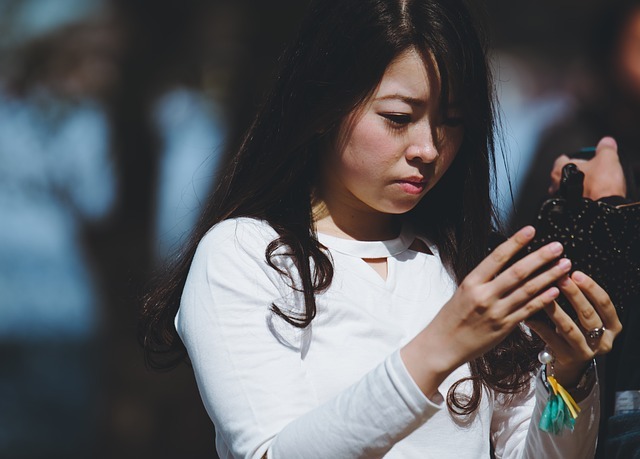 Understanding the differences between the faces of Japanese and Chinese people is an important aspect because one will be able to distinguish between the two nationalities easily. Tour guides and hospitality industries should understand the different facial aspects of the Japanese and Chinese people so that they can use the appropriate language to communicate to them during tour travels and in the entertainment joints. Additionally, communicating to people using their native language makes them to feel appreciated and develop a sense of belonging in the new environment. Jecinta Morgan. "Difference Between Chinese faces and Japanese faces ." DifferenceBetween.net. March 5, 2019 < http://www.differencebetween.net/science/nature/difference-between-chinese-faces-and-japanese-faces/ >. Actually Japanese eyes angle up. Chinese angle down. Kubota, Ryuko. "Japanese culture constructed by discourses: Implications for applied linguistics research and ELT." Tesol Quarterly 33.1 (1999): 9-35. Martinez, Dolores, ed. The worlds of Japanese popular culture: gender, shifting boundaries and global cultures. Cambridge University Press, 1998. Zhenbiao, Zhang. "an analysis of the physical characteristics of modern Chinese [j]." Acta Anthropologica Sinica 4 (1988): 004.